I had a morning of wonderment and joy the other day. It was like Christmas, but better, because the things that put the smile on my face weren't planned or requested, or expected: they just arrived. First of all I received a massive box from my friend Amanda, who lives in Providence. Amanda is an all-round creative being and she makes, amongst other things, hand-blown cake stands for single fairy cakes (or cupcakes, as the Americans call them.) 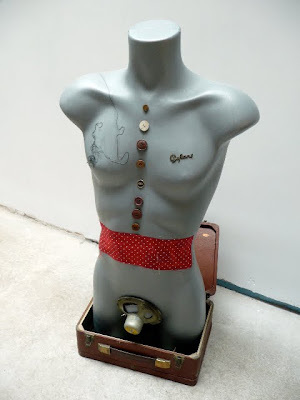 She and I did a trade, but her parcel of oddities far outweighed anything I'd sent her way. First of all there was THIS - a half-sewn half-drawn note. Can't you just HEAR the frantic ZRRRRZRRR of the sewing machine? 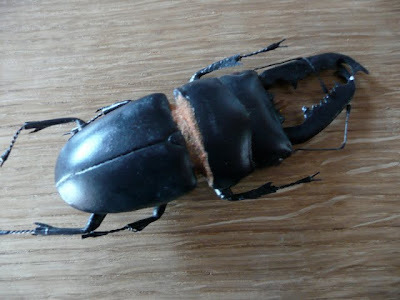 Beetleface leapt out a bit further down, 3" long, but HE was made of stuff we can't identify, with metal bits, and has a magnet stuffed into his belly so he can hang off anything which makes a clonking sound. I tried him on the range flue, but seeing as this can reach 127C at full pelt, I decided melted beetles wasn't a look I fancied. Enough already? NO. 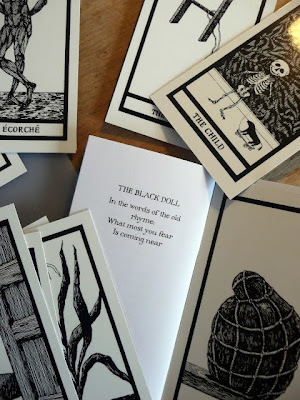 Buried in paper was the magnificent surprise of an Edward Gorey tarot pack - MY WORD. Did I tell her I liked Gorey? No! Did she guess? Can she see it in my face? Shall I tell my own future and that of everyone I know with characters like The Black Doll and The Limb from now on? Yes, I shall. And all this is before I even get to the cake stand. 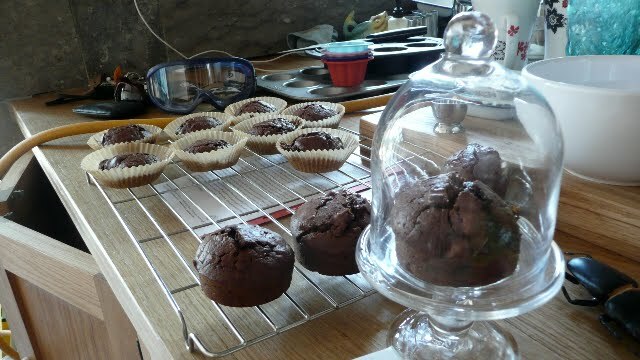 Here it is - and can you believe, I had JUST made a batch of sticky chocolate ones. Popped one inside. Yum. Amanda must have used special Dorian Gray-style glass to make her stand, because the cakes in the tin turned to mush that night...and the one inside stayed smugly perfect and youthful. Then my friend Hayley, who normally writes books like this one showed me her drawing of a rhino. It was so good and so captured the essence of a rhino that I dared her to draw a Mole. Now this was bad of me, because my own drawn animals are always deformed beasts of indeterminate species, but she did it. And here he is. Charmed? I nearly cried. Looks at his massive digging hands! His tiny eyes! His surprised sun-struck face! 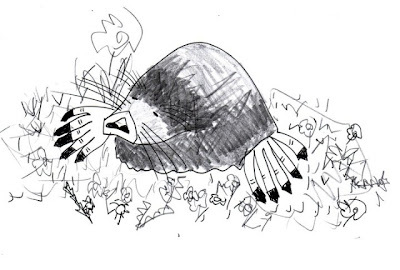 Now that's what illustration's all about - capturing the squinty digness of the Mole. Ten out of ten, Hayls. 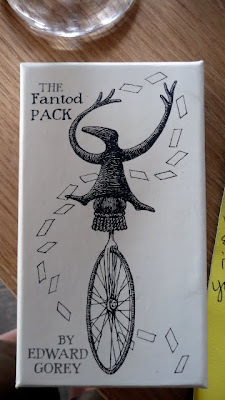 And on the same day I received a thank you gift, which are ALWAYS appreciated - even if I can't drink that wine or eat those well-meant chocs - this was received from Laura and was thoroughly spontaneous, made by hand, and reflective of the arts occasion which triggered it! 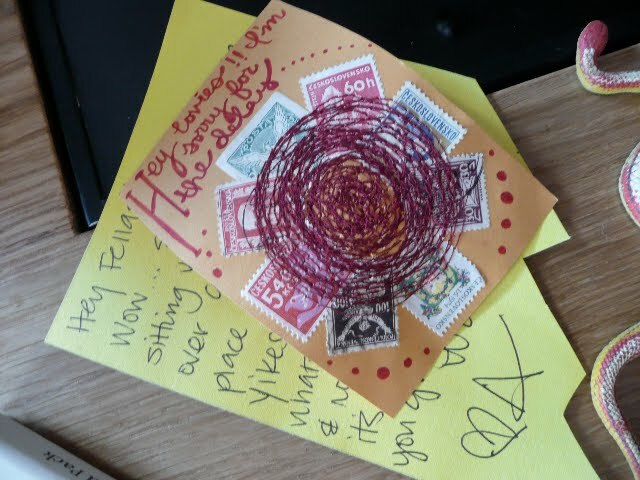 Thank you Laura, Hayley and Amanda aka Ezz.